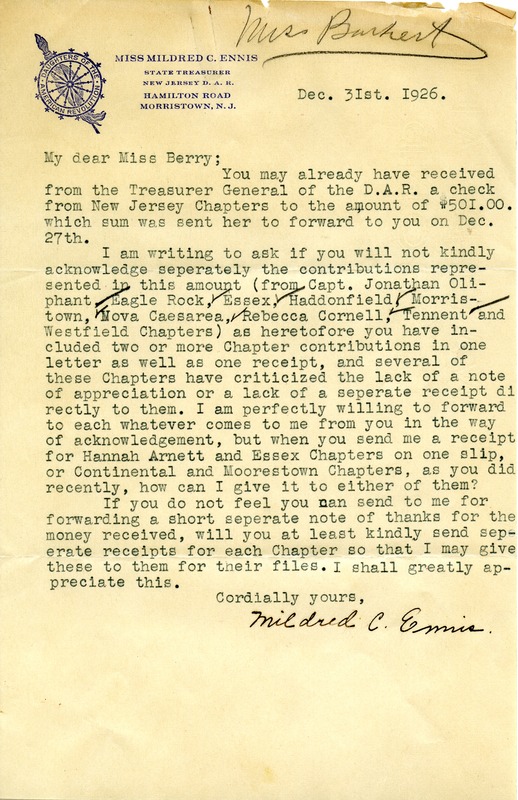 Mildred C. Ennis, State Treasurer of the New Jersey DAR, writes to request separate receipts for contributions from various DAR chapters, rather than the joint receipts issued previously. Mildred C. Ennis, “Letter to Martha Berry from Mildred C. Ennis.” Martha Berry Digital Archive. Eds. Schlitz, Stephanie A., Sherre Harrington, et al. Mount Berry: Berry College, 2012. accessed April 24, 2019, https://mbda.berry.edu/items/show/2439.